The car in front is Dr. Shaw's. The child on the steps with her dolls is Blanche Tucker Kure. Dr. Shaw is attending the birth of another granddaughter Marie Tucker Dreske. Doctors were early adopters of automobiles, as they had to travel distances at some speed. Ford even had a "Doctor's Coupe" body style, though this looks to be a Model T Runabout. Barton Roba Tucker was a private during the Civil War. He was in Co. M 6th Kentucky Cavalry. It was a one year unit. He was actually born in North Carolina in a place called Roaring Gap in 1840. He should have stayed in rural Hood River, as he was in San Diego when he was hit and killed by a street car in the fall of 1911. If the doctor was lucky, he would sometimes have a driver so he could get some sleep on the trip back home. I can't imagine it would be a very good sleep, riding in a Model T on the rough and bumpy roads. Blanche's mother was a Plog, but I did not find a connection to the Plogs featured here at HHR. 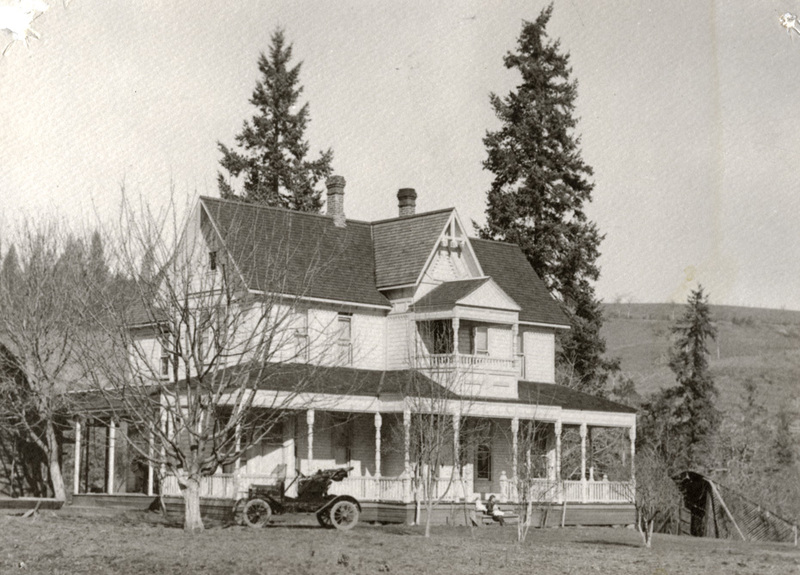 Her parents Charles and Bertha Tucker were living in the home at the time of the photo. Marie Tucker Dreske was born Sept. 21, 1911. As Charlott says, Barton and his wife had already moved to California where he died October 22, 1911. The Dec. 13 1906 HR Glacier says the Commercial Club should take up the matter of electric power because there is an abundance of power at Tucker Bridge. The photo reverse indicates Dr. Shaw is attending the birth of Marie Tucker Dreske, and L.E. indicates Marie Tucker Dreske was born on Sept. 21. This doesn't look like a September picture, looks more like winter with the bare trees. Good point, kmb. Something doesn't add up!